Double Locks are the longest in the country! 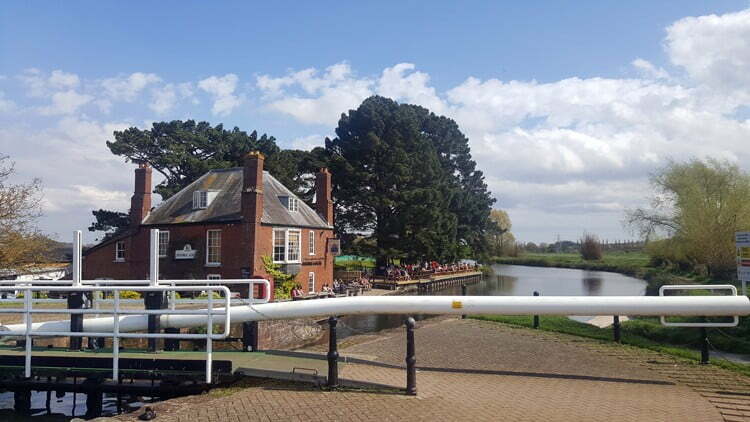 It is situated on the Exeter Ship Canal, which was built in the 1560s, so pre-dates the “canal mania” period and is therefore one of the oldest artificial waterways in the UK! Exeter Ship Canal was opened in 1566, built to bypass weirs that had been erected on the River Exe and thus enable goods to reach the port of Exeter—originally in barges, later in ocean-going ships. Following enlargements and extensions, it reached its present form by the 1830s. The first Double Locks were built when the canal opened in 1701. At that time the Double Locks building was just a small lock keepers cottage. When James Green built the canal basin in the 1820s, he also re-built the Double Locks. Now, not only did it house the horses that worked along the new tow path, but put people up too, as a hotel. The original building was built with Dutch bricks and James Green’s re-build re-used some of these bricks. The locks themselves are the longest in the country! They are 95 metres long and 8 metres wide. They can fit 2 ships side by side (hence the name). When HMS Exeter was refitted in 1938, the masts were used as the lock arms. As with canals elsewhere, its commercial viability was undermined when the railways arrived. Now it’s an excelent pub with canal frontage and loads of outdoor areas, for kids to play and to host beer festivals and bands. It is also a good place to drop your kayak in the water or to start and finnish your bike ride. You have the River Exe nearby and the Exe Valley cycleway, with the Countess Weir, City and mill on the Exe upstream, and the Turf Locks and sea downstream.